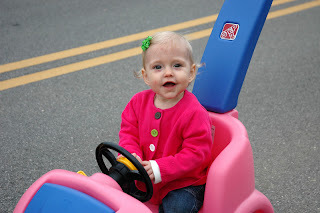 Blair got a pink car for her birthday and she loves it! We don't have a paved driveway, so I push her around the neighborhood. Blair gets plenty of practice doing her beauty queen wave. She waves to people, squirrels, dogs, houses, and most anything I point out. We've already put many miles on the little car. We've had such gorgeous weather lately that we've been going outside every day at least once. 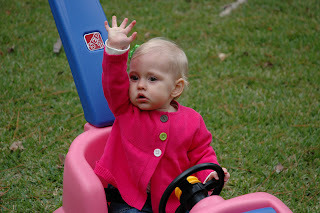 She looks so grown up holding onto the steering wheel just right! 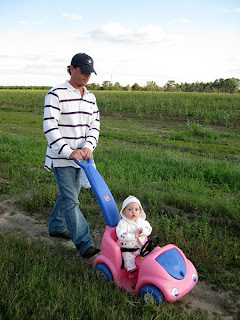 Late afternoon ride with mommy and daddy on the farm. Ashlee, I love your blog! Camila has the same car and she adores it! I love Blair's beauty queen wave! She is gorgeous and I love keeping up with her! 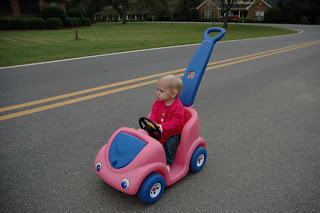 She shouldn't be passing on a double yellow line; or she's going the wrong way. Neither is good, even in Rochelle.